Liverpool goalkeeper Simon Mignolet has taken a pretty amusing and most likely inadvertent swipe at his old team-mate Loris Karius whilst praising the club’s new goalkeeper Alisson. The Brazilian shot-stopper joined the Reds from Roma this season and has been a big hit at Anfield, with Mignolet continuing as backup after Karius left for a loan move to Besiktas. As you’ll all know by now, Karius overtook Mignolet as first choice for Liverpool last season and did a decent job of it for a while – that’s a pretty low bar though, to be fair – before two spectacular errors for Jurgen Klopp’s men in their Champions League final defeat to Real Madrid. 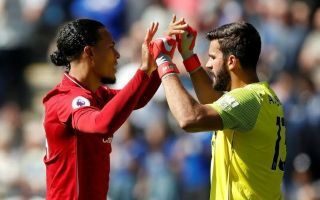 The Belgian will no doubt have found it tricky being behind Karius for so long given there’s not a huge amount between them, though he says he’s finding life as a backup easier now that Alisson has come in as the club’s number one. ‘Yeah, I can accept it easier now,’ Mignolet told the Liverpool Echo. ‘It’s also the fact that the team is playing so well. Ali has been so important for the team.